We are seeing a growing number of new owners of older 112’ Westports. This “Made in America” production boat has a lot to offer but many of these vessels are purchased without a solid maintenance history. Nevertheless, their new owners/Captains still want to bring them back to life. In order to do that, sometimes a total refit of the vessel is required. One of these new owner refits spent a few months at LMC getting a full paint job, mechanical upgrades, interior work and hydraulic systems overhaul and refurbishing. 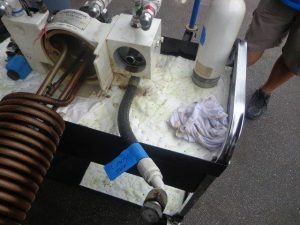 Our capable team of hydraulic technicians was tapped to handle all the hydraulic projects. Starting with the Naiad stabilizer system, we did a full rebuild including removing the shafts and bearings. The entire stabilizer actuator system was also rebuilt back to new. The stabilizer shaft had some corrosion in the lip seal area from sitting too long in salt water so our on-site machine shop, Straight Line Marine, performed a cladding repair. We then moved on to work on the entire hydraulic central system where we performed a full hydraulic fluid flush, cleaned and pressure tested the heat exchangers and changed all the filters. In the engine room, we found that we needed to change a large number of the hydraulic hoses. Hydraulic hoses have a 10-year life and can cause huge problems when they fail on the high-pressure side so it is very important to inspect and replace them during routine service. We also did a little work on the bow thruster, installing new seals in the lower leg, adding fresh gear oil and testing the hydraulic motor. Our team did a full rebuild on the single Maxwell 4500 windlass on the bow, down to the gear box including installing new seals and bearings. 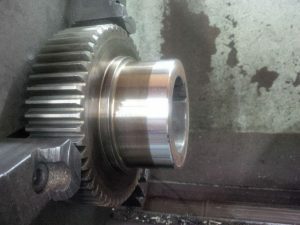 As part of the rebuild, Straight Line Marine also fabricated new stainless steel rings for the main gears to help prevent future gear oil leaks around the lip seals. We also replaced the small Maxwell 2500 capstans in the stern with new electric units due to the cost of installing new versus re-building these smaller units. We found the steering system to be in good shape. There were no leaks on the cylinders so these were left alone. We did, however, replaced a few hoses and upgraded some of the ball valves to stainless steel to help prevent future corrosion. Finally, we changed the fluid and filters. This was a big job from start to finish but our talented hydraulic technicians, supported by our in-house machine shop, were more than capable of tackling every hydraulic system from bow to stern and everything in between.